Imagine you lead a team. You will aim to build on your strengths as a leader, whilst compensating for any weaknesses. There are also many leadership models you can use in your own way. 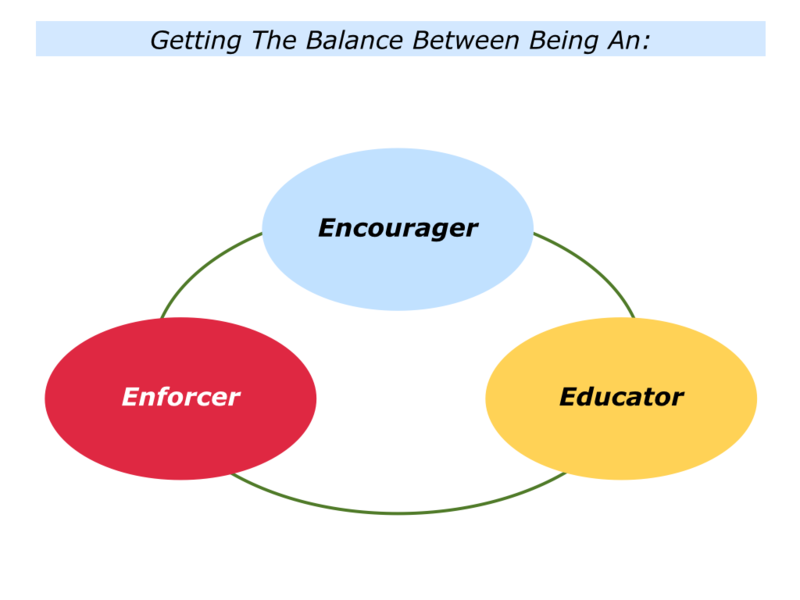 One approach is to combine the elements of being an encourager, educator and, when necessary, an enforcer. Let’s explore these themes. Good leaders encourage people when meeting them in one-to-one situations. They give their full attention to the person and, when appropriate, give specific encouragement. They also show a sincere interest in the person and their development. Such leaders aim to build a positive culture in which motivated people can achieve peak performance. Realising they are always on stage, such leaders aim to be good models. The team members must be self-motivated, of course, but they can also be lifted by a leader who is energetic and enthusiastic. Good leaders often communicate a compelling purpose. They also communicate the benefits – to all stakeholders – of achieving the goals. Such leaders explain the guidelines – the Dos and Don’ts – people can follow to do superb work. They then invite people to choose if they would like to contribute. They implement the right strategy with the right people in the right way. Good leaders are encouraging, but they are also crystal clear. They explain the professional standards people will need to follow to achieve success. As we will see later, they are prepared to act if people choose not to follow those standards. 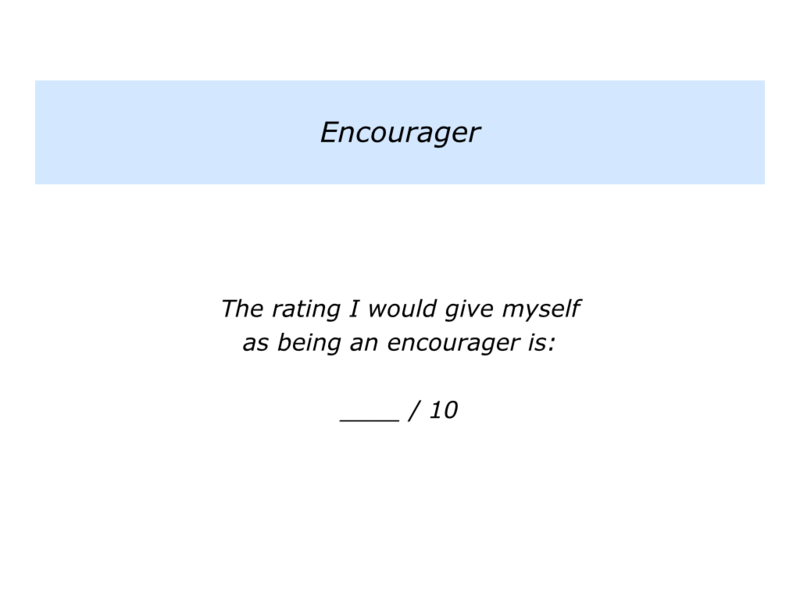 Looking at your own leadership style, how would you rate yourself as being an encourager for the people in your team? Do this on a scale 0-10. Describe the specific things you can do to maintain or improve the rating. Good leaders educate their people to become more self-managing and perform superb work. Different leaders do this in different ways. Depending on their own strengths, they may do this in some of the following ways. They act as a positive model for their people. They coach people to perform superb work. They provide practical tools and educational programmes that enable people to develop. 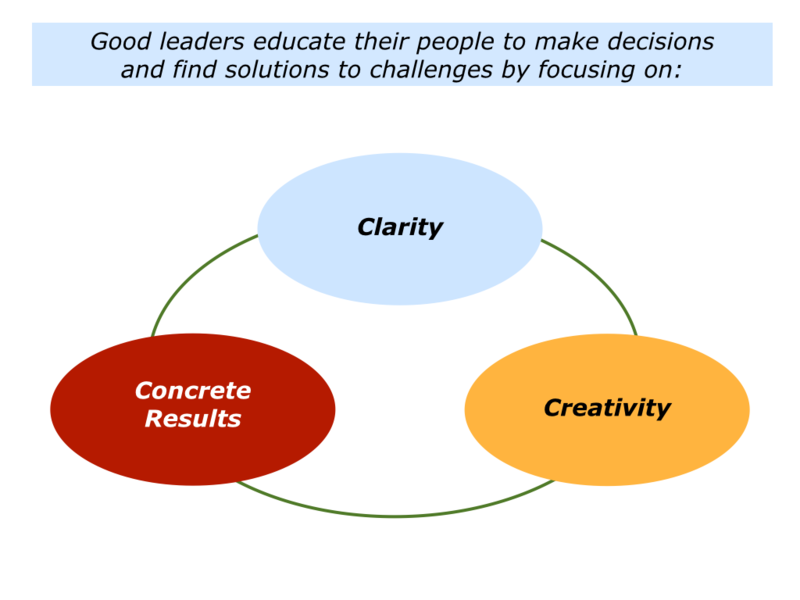 Good leaders often educate people by giving them context and the big picture. They then manage by outcomes, rather than by tasks. They achieve this by doing the following things. They keep communicating the team’s story, strategy and road to success. They explain the What, Why, How, Who and When. 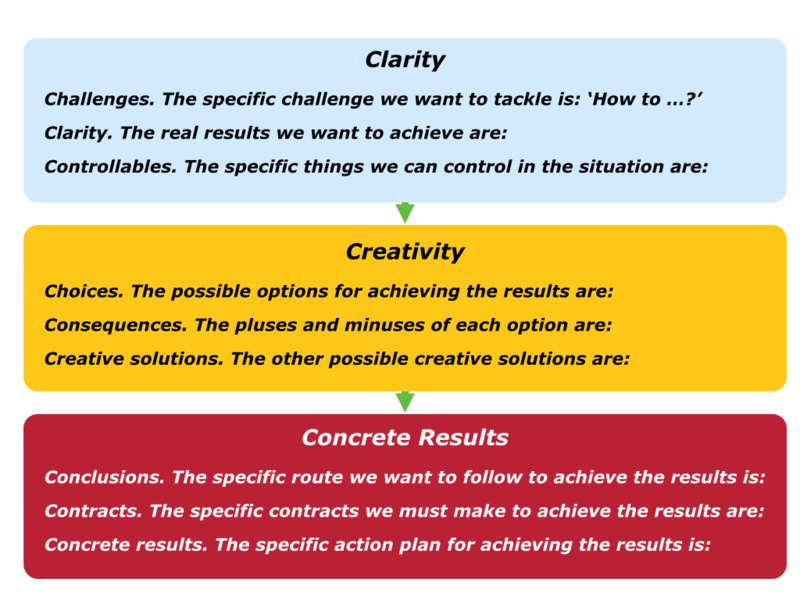 They encourage people to write their goals in outcome terms – describing the specific things they will deliver and by when – rather than as a list of tasks. 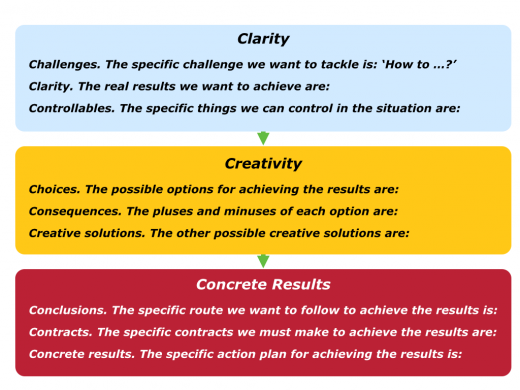 They manage by outcomes – rather than by tasks. When having conversations with people, they continually return to the actual things people have contracted to deliver. They encourage and enable people to deliver those outcomes. Good leaders are decisive. They are happy to make decisions themselves but, when appropriate, they also educate their people to make good decisions and find creative solutions to challenges. Different leaders do this in different ways. Some educate people to focus on Clarity, Creativity and Concrete Results. They encourage them to go through the following steps. 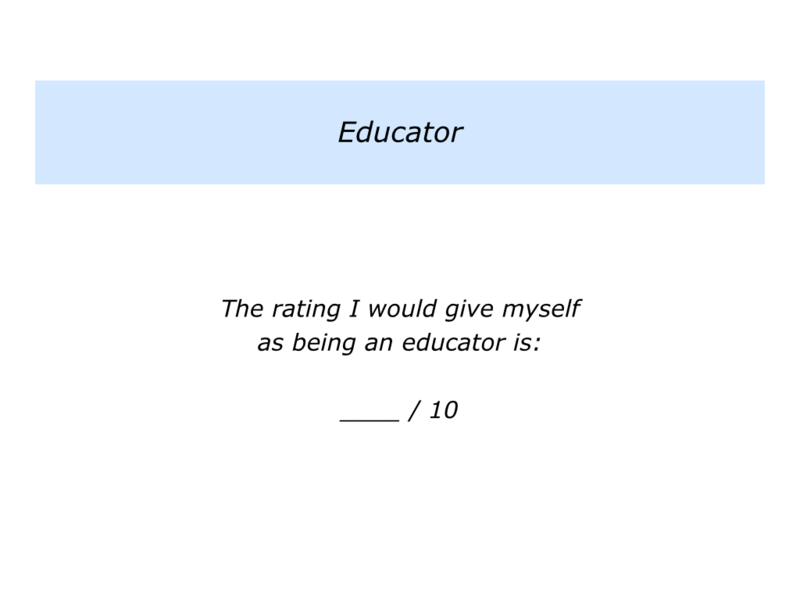 Looking at your own leadership style, how would you rate yourself as being an educator for the people in your team? Do this on a scale 0-10. Describe the specific things you can do to maintain or improve the rating. 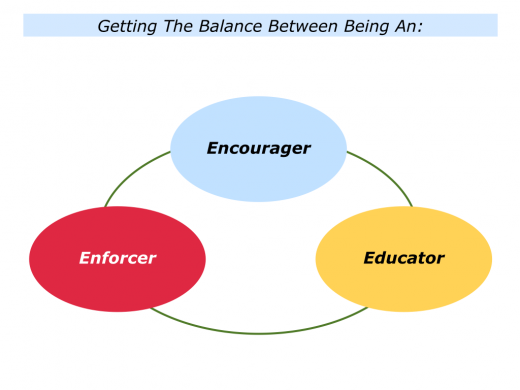 “I score highly on being an encourager and educator, probably 8/10 on both. 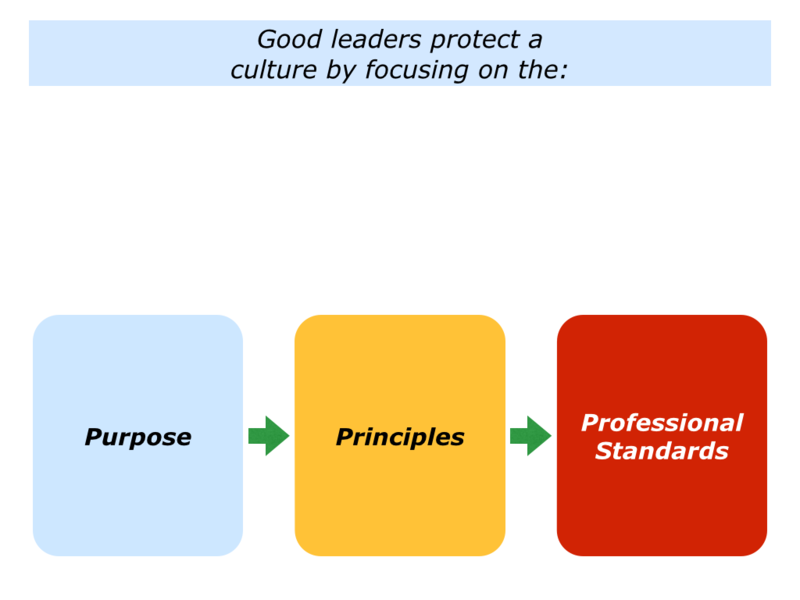 Good leaders see themselves as custodians of the culture. As mentioned earlier, they explain the guidelines and goals to people who want to be part of the culture. Such leaders are prepared to act to protect the environment if some people want to spoil it for others. Let’s explore how to take this step. Great teams focus on their purpose, follow certain principles and translate these into professional standards. So what can you do if somebody continually fails to deliver the required standards? One approach is to act as a policeman and supervise them every day, but that will consume too much time. Let’s look at the alternative approach. Sometimes the person may say: “Yes, but …” They may blame somebody else or want to get into an argument. If so, simply go back to the original agreements that were made when they joined the team. Give the person chance to reflect. They can choose whether they want to follow the required professional standards. You can then give them the opportunity to create and present an action plan for how they are going to translate these words into action. The person can decide whether or not they want to follow the required professional standards. If not, you can replace them with somebody who does want to be positive, professional and deliver peak performance. “I feel comfortable with being a protector of the culture. Great leaders are good encouragers and educators. They are also prepared to be enforcers to protect the environment, however, to help the team to success. Looking at your own leadership style, how would you rate yourself as being an enforcer who protects the culture for the people in your team? Do this on a scale 0-10. Describe the specific things you can do to maintain or improve the rating.